Back in November, El Niño reached a fever pitch, vaulting into the ranks of the strongest events on record and wreaking havoc on weather patterns around the world. Now it is beginning to wane as the ocean cools, so what comes next? It’s possible that by next fall, the tropical Pacific Ocean could seesaw into a state that is roughly El Niño’s opposite, forecasters say. 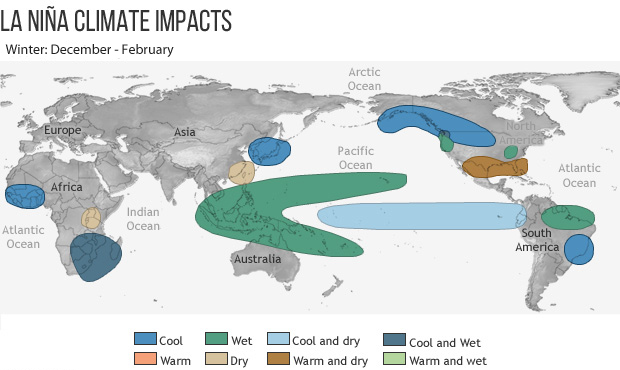 Called La Niña, this climate state comes with its own set of global impacts, including higher chances of a dry winter in drought-plagued California and warm, wet weather in Southeast Asia. But El Niños and La Niñas are particularly difficult to predict at this time of year, so exactly what happens remains to be seen. El Niño and La Niña are part of a cycle that runs over the course of three to seven years. While El Niño features warmer-than-normal ocean waters in the central and eastern tropical Pacific — much warmer in the case of this exceptional El Niño — La Niña features colder-than-normal waters in the same region. Those changes in ocean temperatures are accompanied by changes in the atmosphere: During El Niño, convection and rains shift eastward and the normal east-to-west trade winds weaken or even reverse, while during La Niña, the normal dry state of the eastern Pacific intensifies along with the trade winds. Those atmospheric effects set off a domino effect around the world that can shift normal weather patterns. This El Niño reached a peak in ocean temperatures in November and those waters have been cooling off ever since, following the normal progression. That decline means “it’s almost a certainty that [the tropical Pacific Ocean is] going to go back to neutral in about two months,” Anthony Barnston, chief forecaster at Columbia University’s International Research Institute for Climate and Society, said. What’s still up in the air is whether it stays neutral or continues to cool until it reaches a La Niña state. La Niña’s don’t always follow after El Niños, but seem more likely to do so after a strong El Niño, based on the historical record. That record is quite short, though, which makes it hard to draw firm conclusions from it. But the underlying physics of the El Niño cycle offers some reason to think that strong El Niños do tend to lead to La Niñas. El Niños generate large-scale waves in the ocean (these aren’t like the waves that break on the water’s surface). One set, called Kelvin waves, travel from west to east and cause warming, enhancing the El Niño. The other, called Rossby waves, travel in the opposite direction until they reach Indonesia, where they bounce off the landmass and head back east. Eventually, the Rossby waves catch up to the El Niño and cause cooling, in something of an act of self-sabotage. “The El Niño sort of kills itself,” Barnston said. The stronger the El Niño, the stronger the Rossby waves it generates. If those waves are strong enough, they can not only kill off the El Niño, but “overshoot” in the other direction, driving the system towards a La Niña state, Barnston said. The Rossby waves usually disrupt the El Niño pattern about six months after it peaks, or, right about now. Indeed, forecasters have noted a cool down below the surface of the eastern tropical Pacific in recent weeks, though surface water temperatures are still firmly in El Niño territory. They will gradually follow the subsurface cool-off, though, likely reaching neutral territory by late spring. If a La Niña is in the offing, those waters should be cooling further by mid-summer, though, like El Niño, it wouldn’t peak until late fall or early winter. Right now Barnston puts the odds at slightly better than 50 percent that a La Niña does develop. La Niña, on the other hand, can last for two to three years because the large-scale waves it generates aren’t as well-defined. “It’s not equal and opposite to what you get during El Niño,” Barnston said, so La Niña doesn’t tend to undercut itself the way El Niño does. It’s far too early to tell how strong any La Niña that does develop might be, forecasters say. “It's difficult to forecast strength of events. An added difficulty is that things change pretty quickly when an event is decaying — this is the time of year when the accuracy of forecasts is lower,” Catherine Ganter, a senior climatologist with Australia’s Bureau of Meteorology, said in an email. Barnston said they should have a better idea of the potential strength by August, possibly a bit sooner if there is a very sharp cool down in Pacific Ocean temperatures.